And that’s a wrap. No, the novel isn’t finished. But the month is, and I think I’ve done enough work to call this a victory. I completed the goals I set for myself 30 days ago. I set a new personal record for most words written in a month. I still have the final 4 chapters to write, but those should go down in the next few days. Before we get to the wrap-up, here’s the final stats. Now, on to my thoughts about the month as a whole. First off, I am never doing this again. Not at this level, anyway. Over 135,000 words in a month? If you suggested that in October, I’d have called you crazy. Now, after doing it, I’m ready to call myself crazy. Seriously, this month wore on me more than any other period of writing I can remember. Back in June (I think? ), when I was writing The Shape of Things, I actually quit for over a week, because I was just tired of the story. This time, I really didn’t have that luxury. I had committed myself to The Soulstone Sorcerer. And there were times when I hated that decision. I still don’t completely like the story, even at this late stage. Maybe I can write an ending that will leave me feeling better about it, but I don’t know. If the quality isn’t up to my own personal standards, then the quantity certainly was. I don’t know what possessed me this month, but this is definitely the most prolific I’ve ever been. (Maybe I wanted to get it out of the way. I did feel that way sometimes.) I started out with 5375 words in the first day, about double last year’s opening, and I think that set the tone. I kept a daily average of at least 4500 until the 13th, and the only real reason I lost that streak was because of my bizarre sleeping schedule. Could I keep that pace with a story I truly enjoyed? I doubt it. For this one, I persevered out of sheer stubbornness a lot of the time, boredom the rest. If I had anything else to do at all, I’d never have come close to 136K. I’ll keep going to finish this book, and I hope that won’t take more than a week. Next year, I think I’ll have to find something that won’t run 400+ pages, because I’m tired. I’m exhausted. As soon as this one’s done, I want to curl up into a ball and ignore my keyboard until January. 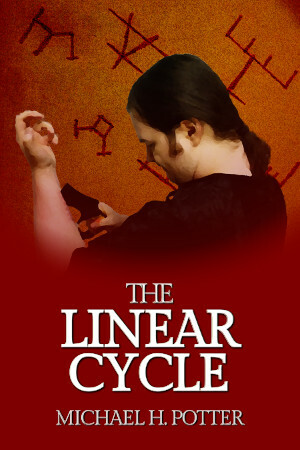 I know I can’t, because I have other things to do (like editing, and making a cover for that pesky Linear Cycle paperback). But I think this will be the last story I write in 2017, barring some unforeseen flash of inspiration. As always, it’s been fun, though maybe not as much this time around. Regular posts start back up next week, and here’s to 6 in a row! Tomorrow, I’ll do a lot of wrapping up, and I hope to get a few more stats put up. Obviously, this is the last day for the projected word count, but I’d like to look back and see just how prolific a writer I’ve been this month. Chapter 24, done. Six chapters to go, and we may have our first actual sighting of the villain. Yay, me. Not much else to say. I’m getting close to the end of this novel, and I hope I can keep this up until I make it there. Shouldn’t be too long now. Oh, and Rudolph comes on tonight, which is as good a sign as any that November is about done. Bring it on, Christmas! That one took a lot longer than I thought. Chapter 23 is done, thankfully, but the little streak I mentioned yesterday had to end, because this particular chapter (all setup, really) ran a bit long. That’s okay, though. I’m down to 7 to go, I think. Next up is a not-quite-travelogue, and then comes the action. The climax. The easy part, right? So this is a pretty odd pattern, but it seems to be working. Finish the chapter you start yesterday, then write the first bit of the next one. I can live with that, especially since I’m closing in on that ending. Chapter 23 is kind of the jumping off point for that, the part where our heroes set out on their ultimate quest. I’m planning for 30 chapters total, so that should work. A little bit later today, but I’ve been writing off and on throughout the day. Trust me on that one. I finished Chapter 21 and started 22, and I’m in that hardest part of the book now: the part just before the ending. Basically, it’s all setup work for the next couple of days. That’s boring, slow, and really hard to do, but I’ve made it this far. Black Friday is here! That’s right, the most important commercial holiday of the year has finally arrived. Fortunately for me, it’s not much different from any other day of November, because a) I’d be doing most of my shopping online, and b) I’m too poor to hit the town in search of deals that were over before I even woke up. So you get writing instead. Chapter 20 is done, 21 is about halfway, and I’m starting the final third of the book. So far, it’s looking okay. Not the best thing I’ve written by far (that honor goes to either Nocturne or Situational Awareness, in my opinion), but I’m not hating this one like I was a week ago. It’s got potential. Now I just have to find a way to get to the ending, and that’s always the hardest part for me. It’s Thanksgiving. I can stand to call it a little early. I’m full, I’m tired, and I just don’t have a feeling of where this chapter’s going. So I’ll let it simmer for another day, and we can hope that Black Friday brings some clarity. It won’t bring shopping, that’s for sure. I don’t know how somebody can write 6000 words without realizing it, but that’s what I did. I don’t know how anybody can write 100,000 words in 22 days, but I did it. Chapter 19 is done, it came out a bit longer than I expected, and it brought me into 6 figures for the month. I just don’t know what else to say. So I might be back on the “chapter a day” streak. I’m definitely on the “writing during the day” streak. Chapter 18 is done, and it’s the first true interaction between hero and villain. By my count, this is the 60% mark of the book, so that might be a little late. Oh, well. We’ll see how it works out. Hope you like A Peace Shattered, the 7th part of my other ongoing series, Chronicles of the Otherworld, which came out today on my Patreon. That one’s still my favorite setting, and I’ll be getting back to it once 2018 rolls around.